Lucinda needs money for a plane ticket to America. To this end, she must find a job. The only opening available is alarmingly nonspecific, and turns out alarmingly exciting! Lucinda shows up for work and discovers that she is to be a professional prince, required to fix broken stories, preserve the narrative momentum, and ensure happily-ever-afters for everyone. There are friends and enemies both to be made, but it can be difficult to fix a story if no one knows how it’s supposed to go. Alicia Wright is a master of satire. Very much like Eggs, Butter, Sugar, and Disaster, this volume reads like a Young Adult mashup of PG Wodeouse, Terry Pratchett, and JK Rowling. It’s a self-conscious sort of humor, genre-savvy, not at all geared toward the lowest common denominator. It’s clever humor, reliant on the reader’s cultural awareness, a vast pile of tropes both revered and ridiculed. The characters are believable; even the villain has his own endearing quirks. Rosie is my favorite, though: a no-nonsense witch who keeps her vampire boyfriend on her magic mirror’s speed-dial. I also love Wright’s explanation of where vampires come from. It’s a well-considered and highly detailed internal mythology that makes perfect sense in context. Dig it. Hmm. If I had to pick something, I’d say that Lucinda doesn’t seem to have much of a real life beyond her parents and the friends she’s saving to visit. I imagine there should be some kind of change in the way she relates to school and daily chores and all the humdrum tedium of Earth life. Real life, though, seems to vanish when she discovers that stories are real. Considering that the book is about the things going on in the Otherworlds, details about the things going on back on Earth aren’t really necessary, but it was a layer that might have been added and felt a bit missing. Brilliant as always for Wright. Pick up a copy. 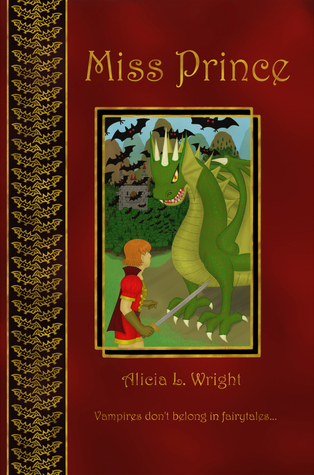 Tagged alicia wright, book review, damsels in distress, fantasy, miss prince, young adult. Bookmark the permalink.